We wanted to share with you about our latest course which, as you know, was held in Espanola, New Mexico, from July 5 -12.2011. We had many familiar faces and a couple of new ones, including Ravi Raj Singh from Toronto, Guru Mander Kaur (her spelling) from Mexico, Ekaum who has taken some lessons with Nirvair Kaur in Arizona, and Sarbjeet Singh from NYC (who had taken the kirtan rhythms course at Winter Solstice, 2010), and Ajeet Kaur (who has been taking lessons with Harbhajan Kaur) spent two or three days with us. We also had a few visitors to morning riyaaz – Har Nak Kaur and Sat Purkha Kaur of Espanola and Guru Jaswant Kaur of Malaysia. 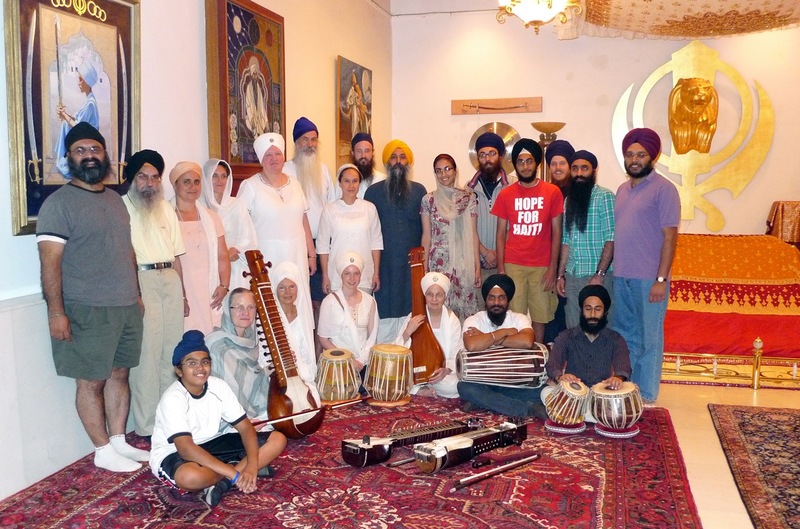 Because we were in Espanola we had the opportunity to share with the community by doing kirtan in the Gurdwara on two occasions and by Bhai Sahib giving two presentations on the musical instruments used in Gurbani Kirtan. It was encouraging to see how many of us were in a position to sing in the Gurdwara. The young people, Keerat Kaur, Gurukaran Singh, Ravi Raj Singh, Amrita Kaur and Nihal Singh, sang one night. The men–Harshdeep Singh, Gurumukh Singh, Kulmeet Singh, Gurusevak Singh, Gurukaran Singh, Ravi Raj Singh and Nihal Singh–sang “Tera Mukh Suhava Jio“. The Italians, Siri Ram Kaur and Dr. Francesca Cassio, sang together; and the women–Nirvair Kaur, Harbhajan Kaur, Sat Kirtan Kaur, Siri Sevak Kaur, Siri Ram Kaur, Dr. Francesca Cassio and Keerat Kaur sang “Preet Preet Guriaa“. And then Bhai Sahib sang “Jap Man Narharay” and showed where our more humble efforts came from. Parminder Singh accompanied us all on pakhawaj along with Nihal Singh. Nihal Singh and Raviraj Singh did some dilruba accompaniment – and Nirvair Kaur played taus for a couple of shabds during Gurdwara – as well as logging some time on their instruments throughout the course, When Harkamal Singh’s played jori for us near the end of the course, we could see the progress made through that focus. Amrita Kaur was working at the bakery this summer, but participated in a few sessions. In our sessions we worked in Raga Gujri and Dhanasri and then settled into Raga Todi for the duration of the course. We listened to masterful alapa and beautiful shabds which Bhai Sahib Ji sang, but we didn’t work on these shabds extensively. He said we were in a new phase where we needed to go deeper rather than just learn multiple compositions. We spent time on how to render alapa and singing fast taans. He created a series of taans in Raag Todi for us to work on at a pace we had never attempted before. We saw slides of the Qila Sarai and facilities at Sultanpur Lodhi, Punjab, and heard the stories about Guru Nanak which took place there. We set dates for our next course, February 9 -20, in Sultanpur Lodhi! We brainstormed about how to raise money for the Anad Khand, or Conservatory, which is being born at Sultanpur Lodhi. Work was begun on establishing The Anad Foundation U.S.A. as a recognized nonprofit so that we can accept tax-deductible donations in this country. We talked about the possibility of a fundraising and public relations kirtan tour in India with Bhai Baldeep Singh Ji and students immediately after our course in February 2012. We have special gratitude to express to Gurusevak Singh and Sadhu Kaur for so generously giving us their home for the course, to Hari Kaur for feeding us wonderfully, and to Kirpal Singh and Kaur, Sangeet Kaur, Hari Charn Kaur, Nirinjan Kaur and Bhai Daya Singh, and Devinderjit Singh for providing accommodations to our members. We are also grateful to Nirvair Kaur and Gurumeet Singh, Kulmeet Singh and Jasdeep Kaur, and Harimandir Kaur and Harjit Singh for extra contributions to the airfare pool which were a considerable help to the rest of us. Nirinjan Kaur and Jasdeep Kaur were busy taking care of the next generation of kirtaniyas, Dhyana Kaur and Mehma Akal Kaur who will be joined soon by a little ones in the households of Gurusevak and Sadhu and Harshdeep and Puneet. And finally, our gratitude to Bhai Baldeep Singh Ji for coming to teach us and for persevering both through this course and through the last fourteen years.